In early 2011 Strategic Land and Planning secured an option agreement for this greenfield site in Honeybourne. At that time it was mostly agricultural land and was identified in the Draft South Worcestershire Joint Core Strategy as a preferred residential development site for 50 homes in the village. We met with the Honeybourne Parish Council, carried out community engagement and held a public consultation event to present our proposals for a development of 100 homes and a new village hall. The local Village Hall Committee had already identified the need for a new building. Overall our proposals gained support from both the parish council and ward member, however they did advise us to reduce the number of homes to 75. When we revised our proposals we also took into account other comments made by local people during the community engagement. 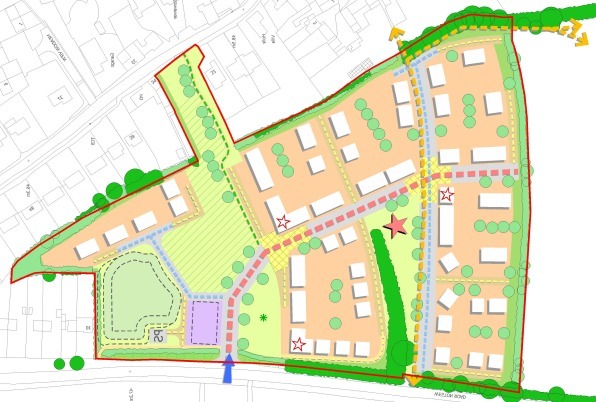 We submitted an outline planning application for a development of 75 homes, with an additional area of public open space and land reserved for the new village hall in a different location on the Weston Road side of the site. In May 2012 our proposal received a resolution to grant planning approval. We signed the Section 106 planning agreement in October 2012, which allowed outline planning consent to be granted. We submitted a reserved matters application in January 2013.